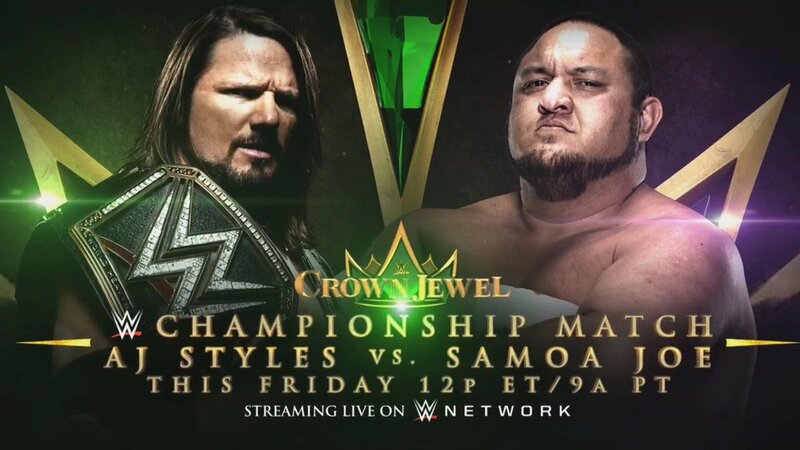 New WWE Title Match Announced For Crown Jewel - Wrestling Inc.
Samoa Joe vs. WWE Champion AJ Styles is now official for Friday's WWE Crown Jewel event in Saudi Arabia. The match was made after Styles retained his title over Daniel Bryan in the opening match of tonight's SmackDown. Joe returned and attacked both men after the match before celebrating with Styles' championship belt. Bryan vs. AJ was originally scheduled for Crown Jewel but Bryan is not making the trip, presumably due to the controversy surrounding WWE's relationship with the Kingdom following the state-sponsored death of journalist Jamal Khashoggi. As noted, tonight's blue brand episode saw SmackDown Commissioner Shane McMahon make Bryan vs. Styles after interrupting an in-ring argument between the two. This was WWE's way of working around Bryan refusing to go to Saudi Arabia. Joe attacked both men after the match and AJ later talked SmackDown General Manager Paige into making the match for Friday.